Escape from the clutches of city life to the serenity of Mulki for a kayaking and camping trip with Mulki Adventure School. An unexplored coastal town near Mangalore, Mulki offers breathtaking waters surrounded by tranquil groves. 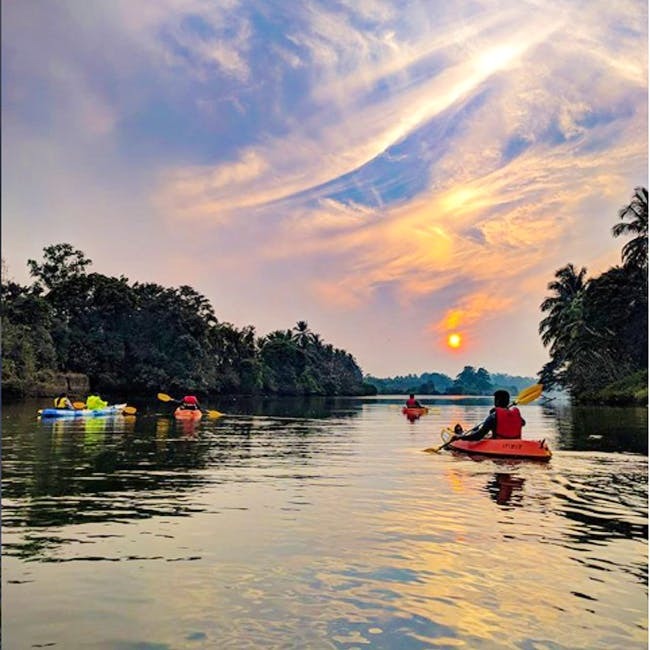 The River Shambhavi makes its way across the town and you can sign up with Mulki Adventure School for a weekend of kayaking and camping along the waters. Started by Shushant - a former techie from Bangalore with a keen sense of adventure - Mulki Adventure Schools offers a special exploration of these waters and its surroundings. Spread across two days, you embark on a 25 kilometre kayaking ride (open to newbies too since the waters don’t pose a challenge) while gazing at the lovely landscape and spotting winged creatures of all kinds. Along the way, you also stop by a village home for a hot meal and a siesta before heading out again. The day ends with a BBQ and campsite fun. On the second day, you kayak your way back and spend the morning at the town’s beach front. This entire experience costs INR 3000 per person. If you don’t have the time for a full-blown outing, then, they even offer a three-hour experience, twice a day. The weekend booking fill up pretty fast so you either book your spot well in advance or head there during the week.